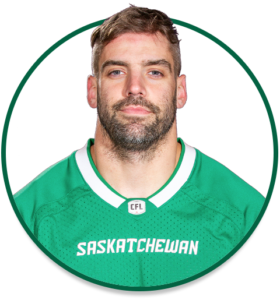 PRO: Acquired by the Riders in October, 2018…acquired by the Montreal Alouettes in January, 2018…selected by the Ottawa Redblacks in the 2013 CFL Expansion Draft…selected by the Alouettes in the 2nd round (11th overall) of the 2012 CFL Draft. 2018: Played three regular-season games, with two starts, for the Riders…had 10 catches for 79 yards…started the Western Semi-Final, registering one catch for two yards…played 15 regular-season games, with two starts, for the Montreal Alouettes…had 13 receptions for 115 yards. Made CFL debut July 1/12. Played 100th career game November 12/17.